Well Obama won with a popular vote of 59.6 to 56.9 million. 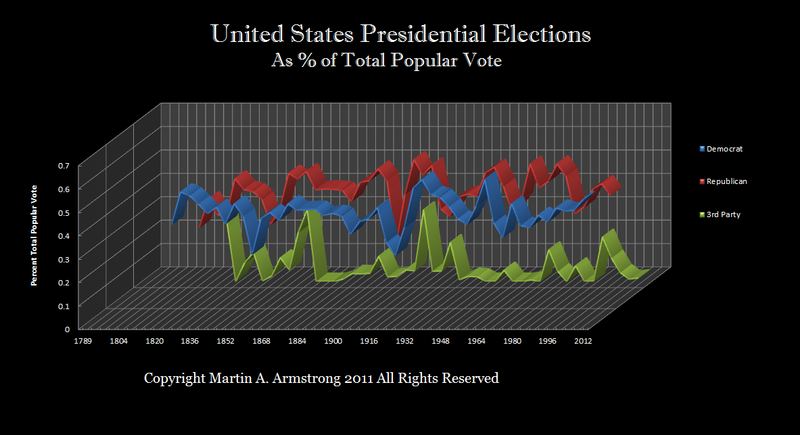 The Electoral votes was 303 to 206 (29 not assigned). This should be no surprise. Our model has long shown the rise of the Democrats as we go into this economic turmoil as the Republicans have been captured by the Religious Right injecting religion into law and politics. This is very wrong for what if the majority became Shiite Muslim? Would it justified to them order all women to be clothed based upon what the majority believes at any one point in time? There should be a FULL separation of church and state. Socrates was put to death for questioning the gods. The real issue is the rising class warfare. This is the nastiest election perhaps in American history. It is the Democrats blaming the “super rich” (income greater than $125,000 per person) for all their failures of Marxist economic promises. They will never blame their unfunded promises. They will never blame themselves for throwing Social Security funds in the same pocket as everything else causing the lack of segregation to undermine the entire future of the World Economy. These are not sinister things that the rich have done – this is failed promises from politicians. The Democrats won because they are the ones that have empowered the majority to vote to themselves the assets of the minority. This has been the Marxist Agenda that started to blow up with Communism in 1989 and should conclude with the collapse of Socialism in the West come 2016. It is 2016 that should be the first opportunity for a third party rising in the United States. The THIRD PARTY should emerge from the middle ground of economics. The Republicans will become the party of the religious right and they will decline further missing the entire point that this is about surviving as a nation rather than abortion and gay rights. Therefore, we should see the rise in THIRD PARTY activity going into the 2016 election. The economy will peak again 2015.75 and turn down really hard. This should seriously damage the Democrats as their false promises collapse. The Republicans have to return to the economic agenda of Reagan and abandon the Religious Right agenda that has no place in politics.